No Time, on a Dime: Oscar Time = Party Time! 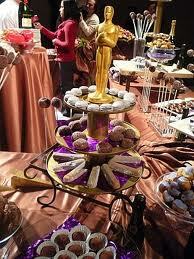 Mark your calendars for Sunday, February 27th and get ready to have an over-the-top Oscar party with all your friends! 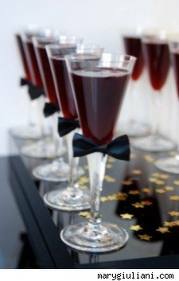 Here is a few tips on how to have a fun, budget-friendly, over-the-top Oscar Party. Use Evite to send out some Oscar Themed awesome e-invitations for free! actors/actress's that are nominated for an award. Place the stars on the ground like in Hollywood or get small wooded dowels (Michael's or Joann's for $0.59) and place them in ground every few feet as signs directing guests up to the door. Use large ostrich feathers in a tall glass vase and light the vase with battery operated Christmas lights. Hide the battery box by dressing up the outside bottom of the vase with either black, gold, or red satin fabric. Place small Oscar statues around tables, and use small mirror's with votive candles on top to create glamorous lighting. Use any movie decor items you might have around the house or visit this site if you choose to purchase some. Cut out Rice Crispy treats with a Star cookie cutter and place a Popsicle stick in the bottom of them and then add a red or gold bow to it. And don't forget to have your guests arrive in their finest attire! Break out those gowns and tuxes or suit's and have a night to remember!